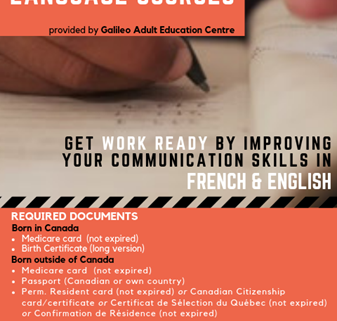 Starting April 8, DESTA will be offering literacy and communication classes in mother tongue English and basic French, provided by the Galileo Adult Education Centre of the English Montreal School Board. These classes will offer students an individualized learning experience, providing them with the language skills necessary to become work-ready or return to school. English classes will be offered from 9 AM to 12 PM, and French classes from 1 PM to 4 PM, Monday through Thursday, until June 21, 2019. 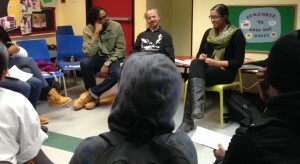 We are booking registration appointments, call 514-664-5042 for more information or to book an appointment. *Reduced rates and stipends are available to qualifying DESTA participants. 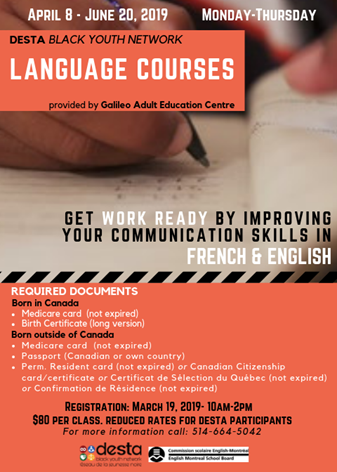 Please note that the English class is not an English Second Language (ESL) course, but is for speakers with first language proficiency.